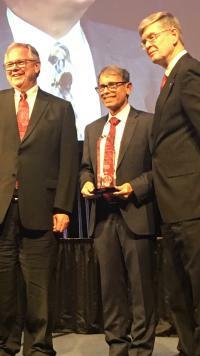 Manjit Misra, director of the Seed Science Center and professor in the Department of Agricultural and Biosystems Engineering, was presented the 2018 ASABE Sukup Global Food Security Award during the 2018 ASABE Annual International Meeting in Detroit, Michigan, on August 1. 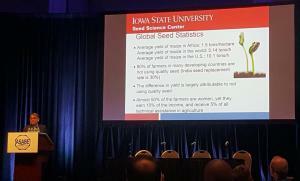 Established in 2015 by Charles Sukup, president of Sukup Manufacturing Co. in Sheffield, Iowa, the endowed award recognizes the enhancement of food security by innovative engineering or the application of engineering in the production and distribution of food, including the storage and handling of grains, oilseeds, and other food products. The award is given annually to one recipient. Misra was also a keynote speaker at the event. 102A Seed Science Center, 2115 Osborn Drive, Iowa State University, Ames, Iowa 50011-1050. Ph. (515) 294-6821, Fax (515) 294-2014. Seed Science Center Hours: Monday-Friday 8:00-5:00 p.m.
Summer Hours: 7:30 a.m.- 4:00 p.m.